If you’re in professional services with a healthcare practice, you know sponsoring healthcare-related seminars, conferences, committees and other events is a terrific way to get your organization’s name out to target audiences in a positive manner, and be seen “hanging” with other notable – and sometimes bigger – names in health services. But getting the biggest return on investment on that financial commitment takes more than slapping your name on a banner. It takes planning and effort. For some, simply being associated with the happenings in the room is the reward, but at SPRYTE, we look for other ways to leverage that sponsorship, whether it’s for ourselves or our clients. Just because that conference is one day, doesn’t mean you should be one-and-done. Seek recurring or ongoing opportunities. 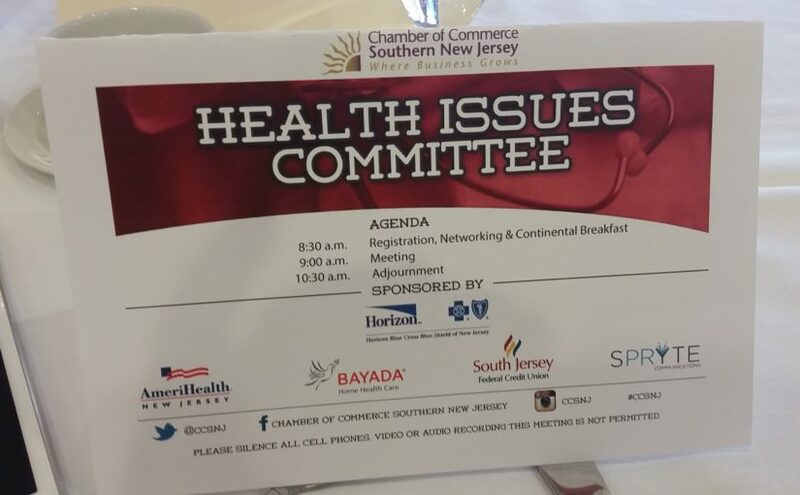 SPRYTE this year committed to sponsor a prominent Chamber of Commerce’s healthcare issues committee, which holds four high-level, members-only meetings during the year, each with its own keynote speaker on a relevant topic. We chose to be a 2017 sponsor to bolster our firm’s reputation as healthcare communications experts. While sponsoring a single event is great, if you can underwrite an ongoing series or recurring meetings even better. Your name exposure and image as a contributor to the industry or community will rise exponentially, especially in the likely event that attendees will differ from one event to the next. Take pictures. Photograph your brand presence at the event, whether it’s a banner or a booth or a tablecloth under the cookie trays. Get pictures of you or your staff at the event, both posed next to your logo and candids talking with other attendees or presenters. Shoot the dais, and the speakers. Never let an opportunity go to include a good photo with your social media posts. Let your industry know: While your sponsorship might not be newsworthy for the local paper, it’s probably just the kind of thing your industry trade publications and your own affiliated groups will want to know about. Send a press release to those publications, being sure to mention the other sponsors (it’s who you’re seen with, right?). If they use the news, share the links on social media. Parlay your sponsorship into speaking opportunities. Frequently, a speaker’s company will sign on as a sponsor, but it can work the other way too. Particularly if your organization will be underwriting a recurring event or a series, you’re in a good position to negotiate a spot on a panel, or a speech by your chief executive. But remember that your proposed topic and content must be relevant to the audience in any case. Blog. In addition to social media, write one or more blogs about the event, your company’s involvement, and the information that was shared. Include links to the host, speaker’s organization, venue if appropriate, and other sponsors. And of course, share the blog(s) on your social media. Ensure you’re getting what you paid for. Event organizers promise all kinds of perks to sponsors, including logo in marketing materials and e-blasts, recognition in the room, and inclusion in their own newsletters or press releases. Inspect what you expect. Make sure your logo links to your site, the ½ page ad you were promised looks great BEFORE publication, the banner with your name stands in a highly visible position for attendees. Be sure to provide the exact wording you’d like them to use about your company when thanking the sponsors verbally or on a screen, and your company and staff’s names are spelled correctly in photo captions the organizer disseminates. Network. When everything is said and done, you want to know who was in the room, and be able to follow up after. Get business cards like they’re going out of style. Arrange sit-downs with those you talked with. And tag them in your social media posts, especially if they are in the picture. If the event host offers a list of attendees, get it, and try to follow up with as many as you can with a brief note, or invitation to connect on Linkedin. Go for those sponsorships if you can, but think of them as true opportunities to market your organization, not simply a way to get your logo seen.